Once upon a time, a better time, there was a ride called the Peoplemover (or as it was known by cast members, the “Peoplemaker” because of the very large number of people who took the opportunity to make out in relative comfort and privacy). 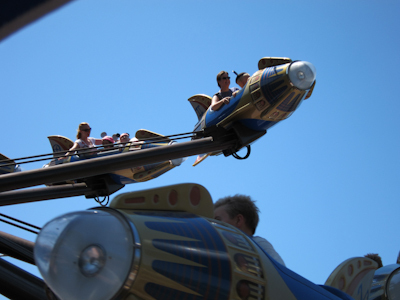 On top of the Peoplemover loading station was a ride called the Rocket Jets. The Rocket Jets were ALL KINDS of awesome. They were space ships that you rode in way up in the sky around and around like you were totally the shiz. The fact that it was way up high in the sky, on top of the Peoplemover, added a totally excellent element. Up high was the way to go. You may have noticed that I’m harping a bit on the up high part. That’s because when they re-did the ride from the Rocket Jets to the Astro Orbitor, they put it down on the ground, and that is the single biggest tragedy of all. The second biggest tragedy is its very inconvenient location. But mostly the height thing. I’d show you a picture of the Astro Orbitor on the ground, but I forgot to take one. Oh well. 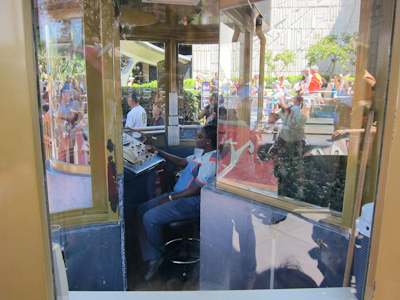 Anyway, the AO is very much like Dumbo in that your ride vehicle is on a long arm and you can go up and down by pulling a lever. In fact, I’ve heard the AO called the “Space Dumbo” before. 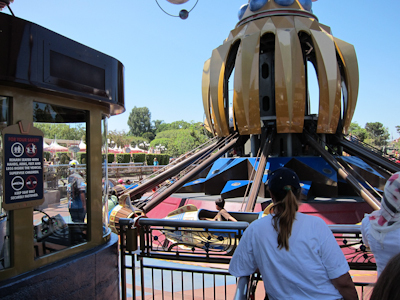 And like Dumbo, due to the nature of the ride, the load time is very slow and sporadic, so the line backs way up. Imagine my surprise then, when Kristin, Monica, our 5 combined children, and I saw a very, very short line for the AO. We pretty much jumped right in. 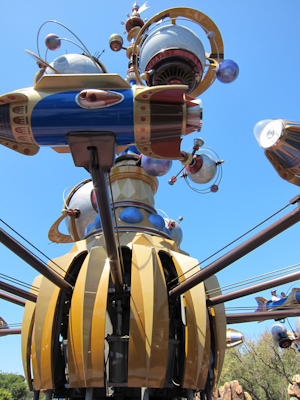 Astro Orbitor pilots at the ready! 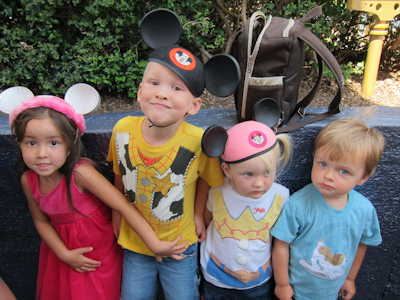 Lexie, Anderson (of Jedi Training Academy fame), Annika, and Theo. Yes, I know that’s only four. We left the baby and the camera with Monica. The queue is an unexciting chain switchback, but when you get close to the ride, the operator is in a futuristic booth and stuff. I attempted to take a vertical picture of the whole ride, but cleverly positioned a rocket right in the way of the details of the ride. Incidentally, this was my first time on this ride, so yay My Year With The Mouse!! Theo has become quite an independent little bugger, but he really looks up to Anderson so it’s pretty easy to keep him in check by having him hold Anderson’s hand. The AO loads at ground level which as you may have picked up, kind of bums me out. Wouldn't life be better on top of the Peoplemover? …and supposedly seats 3 in the bobsled-style seating, but to be honest I seriously had to cram myself in there with two very small children. I was pretty sure they were going to need a can opener to get me out. 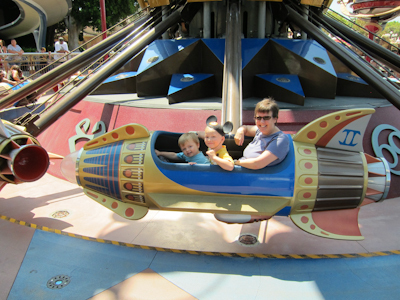 We decided to split up into the boy’s rocket and the girl’s rocket. Wave good-by to the Earthlings–your flight is about to begin! And then blast off for space! And I’ll be honest–despite the fact that it’s located on the ground, we felt like we went surprisingly high. Monica got a great shot of both of our rockets. Poor little Theo is too tiny to be seen in the front of mine. Fly, Kristin! Fly like a bird! 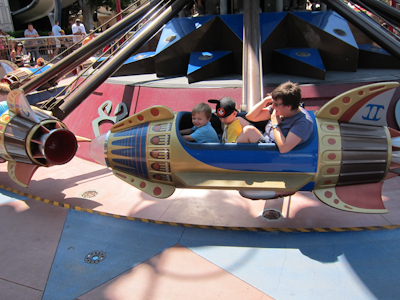 And apparently there was an original Astro Jets soon after Disneyland opened which were again located on the ground. So I guess it’s not so much messing with an original, as it is going back to an inferior position. And the location pretty much bites. It’s right at the entrance of Tomorrowland, which creates very narrow passages for entering the land (did we not learn our lesson from Adventureland? ), particularly with the line for the new Star Tours. But you know, despite all of that, I actually really liked it. I went on this for the first time this summer, twice. Guess that is what happens when you have a little one that cannot do much. We waited about 15 minutes both times, but I saw horrendous lines at other times. I don’t think I would wait much longer than 15 minutes, it’s only a 2 minute ride. Yeah, I definitely wouldn’t wait longer than 10-15 minutes for it, but it’s pretty fun once you get up there. 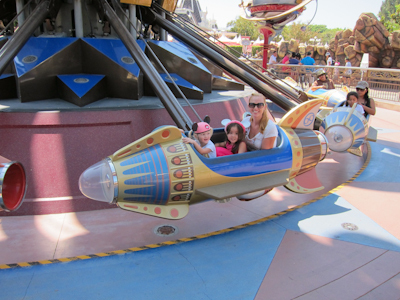 Space Dumbo is exactly what it is but my daughter LOVES dumbo so its still a winner for her. 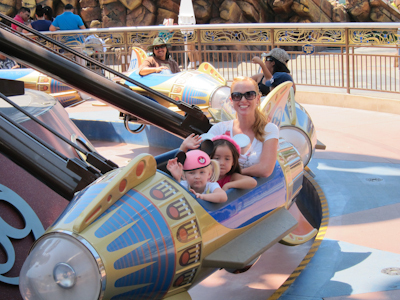 We normaly hit this ride first…. the line later in the day looks scary! I love Dumbo too! And this does add a thrill that Dumbo doesn’t. shoot! spelled “normally” wrong… I hate when I do that. I am with you Shelby, I wish they were still up high – I remember feeling like I was really flying when I was a kid. I liked getting the rocket behind my brother or friend and trying to “catch” them by following their tail as they moved up and down. I think there was a line reason why the moved them – but can you use your SRM to find out the reason? 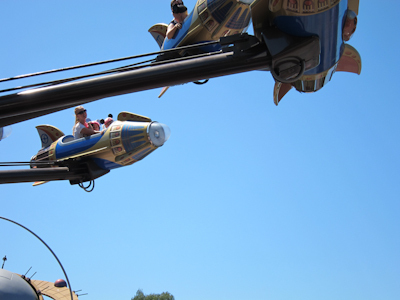 According to Yesterland.com: “The old Rocket Jets structure had new mission in 1998. The PeopleMover loading area became the Rocket Rods loading area. And the where the Rocket Jets had orbited the USA rocket, something called the Observatron appeared.” The Astro Orbitor is made from the old Rocket Jets structure. I also recall hearing somewhere that they had a hard time making the Rocket Jets ADA-complaint, but that may not be true. 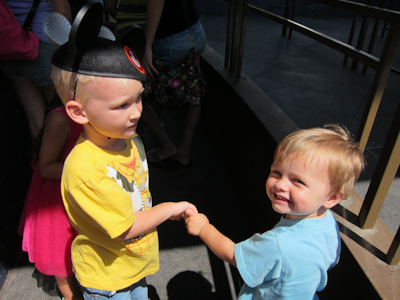 I would have loved to have seen the People Mover – This is a great posting! It does need to be brought up to current safety codes, but a cast member said today that they were rumored to try to bring it back for Disneyland’s 60th birthday (in 3 years). I hope so! It was one of Theo’s favorites at the Mouse-in-Law. Wonderful pics. Theo is growing like a weed! Did you feel dizzy~sick after the ride? I didn’t! I was concerned that I might never be able to use my knee again after cramming it in there though :lol:. You’re right about it being a tight fit. When I rode this a couple years ago with two of my kids, probably 6 & 8 at the time we were crammed inside so that I ended up with scraped up knees. Definitely not my favorite ride. Yeah, I could barely fit with with a 4 year old and a 2 year old. It’s definitely 1 kid 1 adult ride.